Ionic compounds in the crystalline state exist as three dimensionally ordered arrangement of cations and anions which are held together by columbic interaction energies. Ionic compounds in the crystalline state exist as three dimensionally ordered arrangement of cations and anions which are held together by columbic interaction energies. The three dimensional network of points that represents the basic repetitive arrangement of atoms in a crystal is known as lattice or a space lattice. Thus a qualitative measure of the stability of an ionic compound is provided by its enthalpy of lattice formation. solid into its respective ions at infinity separation is taken the lattice enthalpy. DrH o = L.E Lattice enthalpy is a positive value. For example, the lattice enthaply of NaCl is 788 kJ.mol-1. This means that 788 kJ of energy is required to separate 1 mole of solid NaCl into 1 mole of Na+(g) and 1 mole of Cl-(g) to an infinite distance. In ionic solids, the sum of the electron gain enthaply and the ionisation enthalpy may be positive but due to the high energy released in the formation of crystal lattice, the crystal structure gets stabilised. It is not possible to calculate the lattice enthalpy directly from the forces of attraction and repulsion between ions but factors associated with crystal geometry must also be included. The solid crystal is a three-dimensional entity. 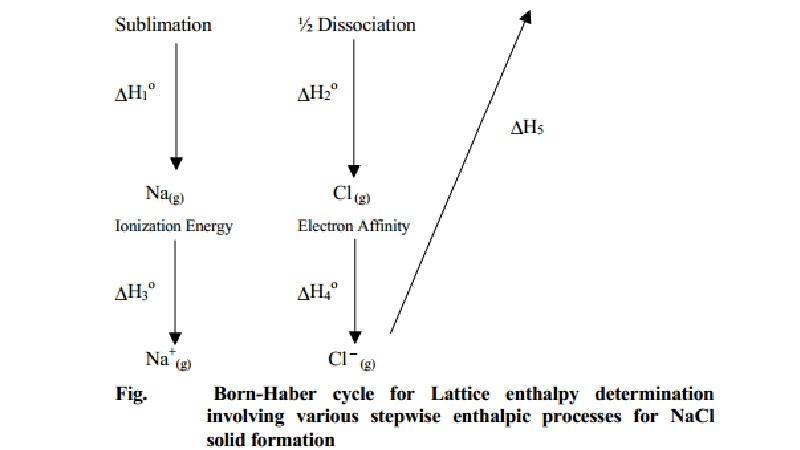 The lattice enthalpy is indirectly determined by the use of Born - Haber Cycle. The procedure is based on Hess's law, which states that the enthalpy change of a reaction is the same at constant volume and pressure whether it takes place in a single or multiple steps long as the initial reactants and the final products remain the same. Also it is assumed that the formation of an ionic compound may occur either by direct combination of elements (or) by a step wise process involving vaporisation of elements, conversion of gaseous atoms into ions and the combination of the gaseous ions to form the ionic solid. For example consider the formation of a simple ionic solid such as an alkali metal halide MX, the following steps are considered. ∆ H0(5) = the lattice enthalpy for formation of solid MX (1 mole). ∆ H0(f) = enthalpy change for formation of MX solid directly from the respective elements such as 1 mole of solid M and 0.5 moles of X2(g). The greater the lattice enthalpy the more stabler the ionic bond formed. The lattice enthalpy is greater for ions of higher charge and smaller radii. The lattice enthalpies affect the solubilities of ionic compounds. Since the reaction is carried out with reactants in elemental forms and products in their standard states, at 1 bar, the overall enthalpy change of the reaction is also the enthalpy of formation for NaCl. Also, the formation of NaCl can be considered in 5 steps.The sum of the enthalpy changes of these steps is considered equal to the enthalpy change for the overall reaction from which the lattice enthalpy of NaCl is calculated. ∆ H0(1) for Na+(g) + Cl-(g) -- -- > NaCl(g) is ? NaCl(g) → Na+ (g) + Cl- (g) only. Lattice enthalpy value from ∆ H0(5) is written with a reversed sign. ∴ Lattice enthalpy of NaCl = +788.0 kJ mol-1.